A demonstration was staged in Liverpool city centre in an attempt to lead bystanders “to a vegan conclusion”. 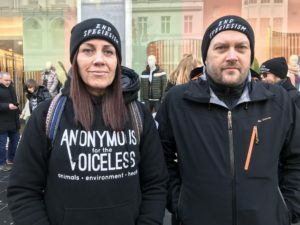 Anonymous for the Voiceless (AV) was established in 2016 as an animal rights organisation that specialises in street activism. 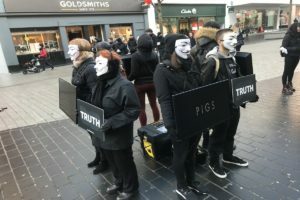 It has an abolitionist stance on eating meat and animal produce and wants to recruit more people to their cause..
On Sunday, the static display in Church Street named ‘The Cube of Truth’ was designed to trigger the curiosity of the public and initiate conversation on the topic of veganism. AV shows footage on screens held by volunteers wearing masks of what they claim “goes on in dairy and meat farms” and the conditions chickens, cows and pigs have to live in. He told JMU Journalism: ”We want to raise awareness as not everyone is aware of what actually happens to the animals. Event organiser, Brian Walsh, initially became a vegan in efforts to help his health, but then came across the organisation and joined. “People shouldn’t eat them because it is cruel and unnecessary now when there are so many alternatives about. Animals are treated in an awful way in most farms. Brian says they do not approach the public, as they wait to be asked before giving information about the videos. Volunteer, Elaine Millington, told JMU Journalism: “I am here today as I have been vegan for six years. When you are vegan the stuff you see on the internet about animals really gets you down. AV has operated more than 10,000 demonstrations in locations all over the world, including Berlin, Melbourne, Cape Town and Chicago.